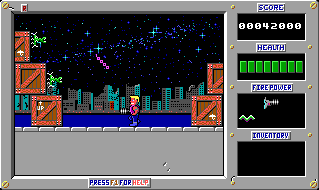 Apogee's first big success was Duke Nukum, a cool, fast action platform game with the cool, fast action hero Duke Nukem. Because of the success of the first game, many sequels followed. In the second sequel, Duke Nukem 3D, the main attraction was the attitude of the character, with every gunfight he had a new catch phrase. 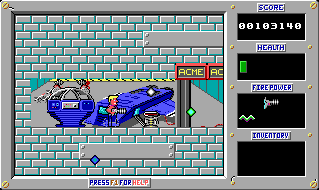 In the first Duke Nukem game however, the best feature was that everything could be shot. Not just the enemies fell victim to Duke's destructiveness, but also walls, laser beams (no need to search for switches), chests, health items (fry that chicken) and valuable objects. Unused pictures are pictures that are inside the game files, but never show up in the actual game. They are like fossils that give insight in the development of the game. Duke Nukum - If he's really that trapped, he should press F1. This picture is inside a file that's called END.DN3. Notice that it says Duke Nukem. 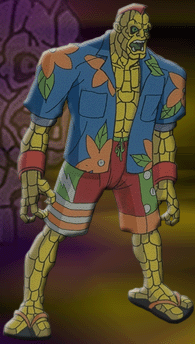 In later versions of the game Duke was renamed Nukum because Nukem infringed on the copyright of a character from Captain Planet with the same name. 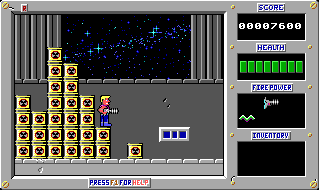 In the sequel to the game the name was changed back to Nukem, as it turned out not to be a copyright problem after all. 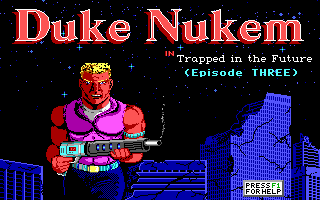 The original Duke Nukem is a scientist character gone mad after a radiation disaster that left him addicted to X-rays. Now he needs to charge up at nuclear power plants, which he calls 'catching some rays'. For more psychological insight in the character and more of those witty puns visit the official Captain Planet website at Turner.com. The walking Duke shown below was found by us in the MAN0.DNx files where x is the episode number. Notice the way Duke turns his head, he shoots faster than his hair can keep up with. Inside the files there's also a black Duke Nukem with blond hair. Much like Wesley Snipes in Demolition Man. Can you dig it?! Using that character in the game would have been really ground breaking. Not only is the guy black, he isn't wearing pink either. Duke Nukum - Hey, what did I ever do to you? Duke Nukum - Isn't that Dukes evil twin from a parallel universe over there? You have probably noticed that every computer game ever created has crates and barrels. That's because game designers can't think of something original. Crates are used to store items such as health, ammo, money or points or they function as barriers or some sort of stairs. On top of that they are easy to draw or model because they are simple cubes or cylinders. As if the excessive use of crates isn't unimaginative enough, some designers don't even take the time to create their own version of the crate and just plagiarize the exceptional work of art some other game designer created. 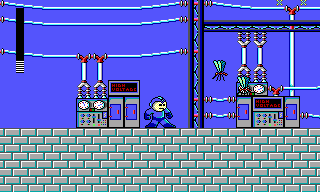 Mega Man - Some excellent specimens of beautifully drawn storage devices, truly eye candy. Duke Nukum - You can't spell creative without crate. 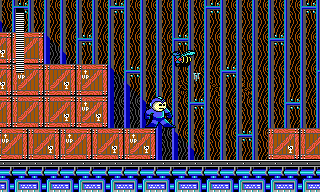 The crates and barrel images of Duke Nukum were borrowed from the game Mega Man. It is a PC-only version of the Nintendo hit series made for Capcom in 1990 by Hi-Tech Expressions, a software company that is known for their crappy games. As this title is no exception, only Duke Nukum fans should play it just for the joy of finding the crates. 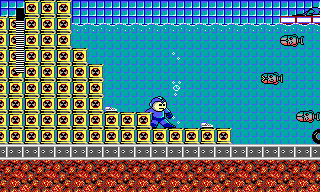 Mega Man - All that nuclear waste dumped on the bottom of the sea clearly mutated all the nice fishies into horrible machine mutants. Duke Nukum - All that nuclear waste obviously destroyed the atmosphere. Who cares, the starry sky is pretty. The crates and barrel images of Duke Nukum are not the only images that are borrowed from Mega Man. Also some bricks were copied. Mega Man doesn't have the honor of being the only game that has some of its graphics used in a Duke Nukem game; Duke Nukem 1 and 2 also borrowed from Turrican and Savage. Crate Review System, Old Man Murray utilized the inevitable existence of crates in games to come up with a rating system. The quicker a player encounters the first crate the worse a game is, because that crate marks the point where the developers ran out of ideas. This comment is from the level designer's point of view. Listed are the reasons why a crate filled level is the perfect level. At the start menu press ALT + F6 to play the demo level. In the last level of Episode 2 there's a shortcut and this video shows it around 00:37. Duke Nukem Central Everything you'll need to know about Duke Nukem 1 and 2. The Duke Nukem Repository A vague gaming site about Duke Nukem. Pixelmusement - Ancient DOS Games - Episode 51 A video review of Duke Nukem. LGR : Duke Nukem Series Retrospective A video review of almost every Duke Nukem game. Duke Nukem 1 Episode 1 at TASVideos A tool-assisted speedrun of this game. The S&F Prod. Duke Nukem II Page We've also got a page about the sequel to Duke Nukum, Duke Nukem II. Apogee The creators of Duke Nukum. Duke Nukum at MobyGames Duke Nukum's entry in the game database. Duke Nukum at Wikipedia Duke Nukum's entry in the free encyclopedia.